Gardens and literature are deeply linked. As literature inspired many revolutions in garden design, in the same way gardens have always been an inspiration for writers and poets. The relationship between these two arts is a very interesting subject, and that's why I decided to write a few posts on this topic. This is the first post, and it is about one of the most influent people on the subject of Picturesque: John Ruskin. Ruskin spent the last 28 years of his life in Brantwood, in the Lake District. This place represented for him both a shelter during his period of illness, an inspiration for his writings, and a place for recreating atmospheres he had seen and studied from paintings and during his long travels around Europe. 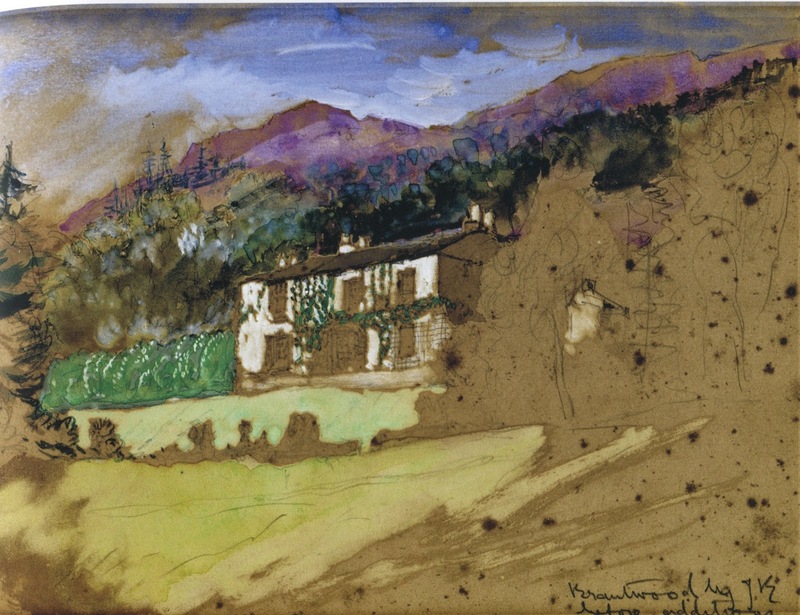 John Ruskin, Brantwood from the edge of Coniston Water. 1871. He also wanted to use this space to experiment with his new social theories. What he creates around his house is similar to an alpine garden but you can't really find a resemblance with the kind of gardens that were fashionable at that time, nor with any garden scheme of the past. During his travels Ruskin rarely stopped to visit parks and gardens, he preferred wild nature by far. Even though we know that he visited Chatsworth and Blenheim with his parents, what moved him most in these palaces were the paintings by Claude and the Carracci. When he came to Italy one of the most fascinating places he described in his letters were the Alps, with all their majesty, and this is the main feature of his garden in Brantwood. We know many things about this garden and Ruskin's improvements thanks to W. G. Collingwood, artist and biographer of Ruskin, who spent much time with him in Brantwood. Ruskin had little to say in praise of Japanese art as he knew it, because they could not draw pretty figures, and he had no admiration for dwarfs or monsters; but one cannot help thinking that if he had seen Japan, and if it is all that travellers tell us, he might have written some enthusiastic passages on a people who love stones for their own sake and tub themselves daily. But one of the clearest characteristics of Brantwood is that every part of the garden had to be useful. So we can see a cottage garden with fruit trees, a fishpond for studying fish, and many water reserves. Above all, he wants to leave nature as untouched as possible. Ruskin deplored the manipulation of nature and the use of glass houses, very popular in those years (he often criticizes the Crystal Palace, built in 1851 for the Great Exhibition of London because it represented the subjugation of the society to commerce and industry). Transforming his estate as little as possible was Ruskin's way to put in practice his theories on returning to simple beauty and nature. Bennett, Jackie. The writer's garden. How gardens inspired our best-loved authors. London, 2014. Collingwood, William Gershom. Ruskin relics. London, 1903. Hunt, John Dixon. Ut pictura poesis, the picturesque, and John Ruskin, in: MLN, Vol. 93, No. 5, Comparative Literature (Dec., 1978), pp. 794-818. The Johns Hopkins University Press. Hunt, John Dixon. The Wider Sea. 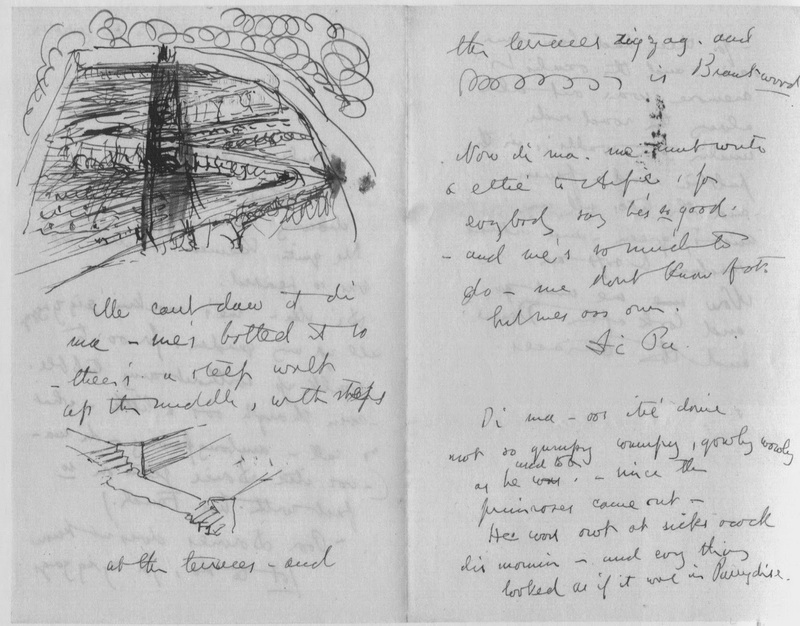 A life of John Ruskin. London, 1982. Ingram, David. The Gardens at Brantwood. Evolution of John Ruskin's Lakeland Paradise. London, 2014. Tyas Cook, Edward and Alexandrea Wedderburn. The Library Edition of the works of John Ruskin. London, 1903-12.